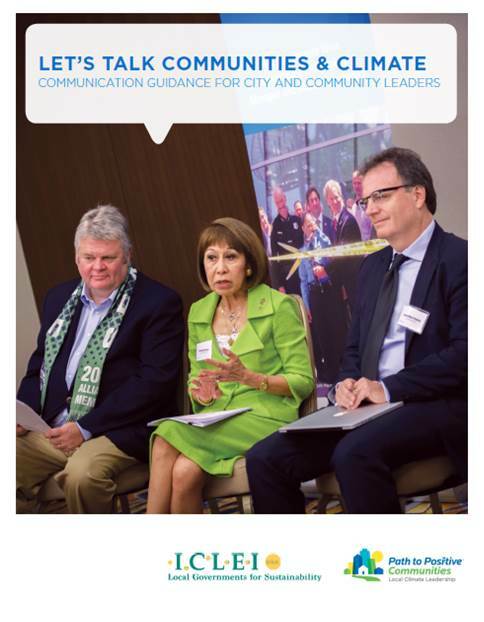 The letter to ICLEI network cities below is from ICLEI USA Executive Director Angie Fyfe, published in the newly released report Let’s Talk Communities & Climate: Communication Guidance for City and Community Leaders. The report is designed to help experienced and novice climate change communicators by synthesizing the latest academic research and message testing on climate communications. Download the full report: Let’s Talk Communities & Climate. Last year’s entry into force of Paris Climate Agreement was a crucial step forward in the efforts to transform communities around the globe to low-carbon, climate-resilient societies. The year 2016 also saw the conclusion of HABITATIII and the adoption of the New Urban Agenda, which defines comprehensive guidance on integrated sustainable urban and territorial development. Meanwhile, the biodiversity agenda advanced with the implementation of a ten-year work plan of nations, cities, and states. The manner in which these global agendas transfer into the local context is of course up to the communities themselves. In the United States, communities continue to implement bold climate plans, ensuring progress toward a sustainable future. In its three years of existence, ICLEI USA’s ClearPath greenhouse gas (GHG) emissions management tool has accumulated a vast quantity of data. At the end of 2016, ClearPath contains 576 community-scale and 439 government operations inventories. This data indicates that communities are active in their GHG measurement and management. However, to build support for local climate solutions, mayors and other leaders must effectively engage citizens and stakeholders within their communities. A key step is to ensure that leaders are well equipped to communicate local climate solutions to their citizens. This guide provides that support. Featuring research-proven practices for successful climate communication, this guide is a vital tool in every community leader’s tool kit. From talking points to counterpoints, “dos” and “don’ts,” proven steps to create custom messages, and a model speech, the guide helps political leaders to successfully integrate climate into conversations, speaking engagements, and other communications. We thank ecoAmerica for their work on this publication and we wish you the greatest success on your path to positive solutions. Let’s Talk Communities & Climate was produced by the Path to Positive Communities program in collaboration with ICLEI USA and ecoAmerica. This entry was posted in CityTalk USA, Guidebooks, Resources and tagged climate change, communications. Bookmark the permalink.